Mobility is already the springboard for considerable business innovation. Soon, mastering mobility will be a prerequisite for even doing business. The decisions organizations make now regarding mobility, in this still formative stage, will shape how well they will perform for years to come. 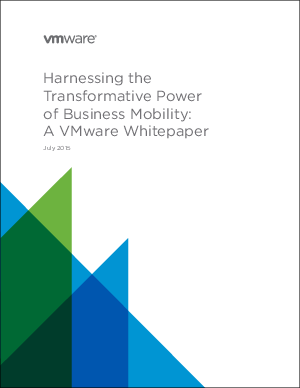 Download this whitepaper to discover how VMware backs its pioneering business mobility technologies and solutions with a leading market presence and an unmatched track record of innovation in the modern end user computing space. Organizations seeking a measurable impact on their industries and with their customers can turn with confidence to VMware to help them harness the transformative power of business mobility, on any scale, today and going forward.